Bangkok is one of the world's most exciting cities. Visit the magnificent temples, palaces and museums. Cool out in the parks. Savour the lively nightlife. Plunge into the shops. Gorge on the wonderful Thai cuisine. Take a trip down the Chao Phraya River, the enchanting 'River of Kings'. Founded in 1782, Bangkok is a young city that constantly changes, constantly fascinates. The Thais call it Krungthep, the city of angels. Visitors just call it one of the great experiences. Bangkok is an intricate puzzle of a place, with layer after iridescent layer of mystery, conundrum, and paradox. Capital of the Kingdom of Thailand, it is an adrenalized metropolis of ten million people, with towering glass and concrete skyscrapers, rooftops bristling with television antennas, and probably the most spectacular traffic jams on earth. And it is a holy city, studded with splendid temples, shrines, and monasteries, haunted and blessed by thousands of gods, ghosts, and angels. Because the city has no real geographical core, no central point a visitor can navigate from, perhaps a good way to explore it is by historical periods. Bangkok is relatively young as Asian cities go-about two centuries old-but its cultural heritage extends back to the founding of the original Thai monarchy in the 13th century, and far beyond that, into the ancient underworld of ritual and myth that lies beneath the surface of everyday life in modern Thailand. This is a Buddhist nation, but it has delightfully variegated the faith, combining Theravada, the oldest, most traditional school of Buddhism, with Hinduism and native Thai animism. At Bangkok's wats, or temples, you see this vibrant, convoluted spiritual world in all its living glory. Surrounded by gilded gods, golden spires, and ritual objects of every size and description, the Emerald Buddha looms over the central chamber, seated on his own elaborately tiered gilt mountain, with a delicate spiked parasol of gold above his head. The Buddha's flesh glimmers like moonlight, twinkles like a star in the shadows. There is real magic, real power here that the incredible agglomeration of art and architecture in the rest of the wat somehow misses. Sometimes, less is more. 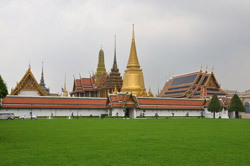 Everyone who has spent much time in Bangkok seems to have a favorite Wat Arun has its cool riverside porcelain monuments; Wat Pho, its 145-foot-long Reclining Buddha; Wat Traimit, a 10-foot-high Seated Buddha of solid gold. My favorite is the Wat Saket, situated on the Golden Mount, a century-old concrete mountain that towers 254 feet above the city. That may not sound like much, but on the dead-flat plains of Bangkok-just slightly above sea level-it is something out of a dream, a miniature alp floating on high like a mirage.There was a sense of timeless calm within those walls, but there was vitality, too. Most of young monks would leave the temple after about three months and return to the secular world outside. Spending two months-a period describes as blissful-in a monastery, they would get jobs, marry, and raise families. But they would never completely lose the peace, the transcendent wisdom they had found in that magical place. The effects of the monastic experience, common to almost all-young Thai men and many young women, are palpable. Thais are tough folk-if you harbor any doubts, just watch a local kick boxing match or check out the paratroops that guard Chitaladda Palace. Now to Bangkok's earthier, more worldly side. If two terms sum up the Thai attitude to everyday life, they are "Sanook-Have a good time," and "Mai pen rai-Never mind." The city's carefree attitude is manifest in myriad shopping centers, bazaars, hotels, restaurants, nightclubs, massage parlors, and discos. Always the unexpected, the revelation, the happy surprise, the pearl in the oyster. Even the city's name. Bangkok means "Village of the Wild Plum", from a small trading settlement on the banks of the Chao Phraya River, long since swallowed up by the mushrooming metropolis. The authentic name, the one Thais use, is Krungthep-"City of Angels." But even that is only an abbreviation of the real name, which is, in fact, in the Guinness Book of World Records as the longest place-name on earth: "Great City of the Angels, Supreme Repository of Divine Jewels, Great Land Unconquerable, Grand and Prominent Realm, Royal and Delightful Capital City, Full of the Nine Noble Gems, Highest Royal Dwelling Place and Grand Palace, Divine Shelter and Living Place of Reincarnated Spirits."